A low-born thief loves a Moroccan Princess. She must marry to escape death at the hands of her enemies. The groom is able to wed or cast away his bride simply by saying "I Marry You" or "I Divorce You" three times. In World War II, the island of Malta, strategically located and vital to supply lines in the Mediterranean Sea, is fiercely attacked by the Germans, but staunchly defended by the British. Lieutenant Commander Ewen Montagu: Suppose I wanted to put a dead body in the sea, and let it float ashore, and have it accepted by the people who find it as the victim of an air crash at sea. What sort of body would I need? This is a great movie about WWII. I know we don't have scenes of battles and violence, but maybe this is one of this movie's advantages. I don't think blood and shots are really necessary to make a film about a war. Wars are not only made of guns and soldiers, but also of officers who make plans and articulate attacks while they're in secret rooms using every kind of ways to confuse the enemy. 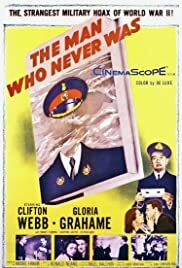 In this movie it is decided that British forces would use a corpse with false documents attracting Nazis attention to Greece while the Allied Forces would land in Italy. Easy, but fascinating plot! Watch it!